Maybe there was a sly strategic genius to Joe Lhota’s performance last night, in his first big appearance as a mayoral candidate. Maybe he was trying to play against his reputation for hotheadedness. Maybe he was trying to prove he’s not one more glib, verbose career politician, like the four who were onstage with him at the St. Paul Community Baptist Church in East New York. Or maybe he figured this was a room he had no chance to win over. Because by conventional political standards, Lhota was a dud. He sat patiently for nearly 30 minutes and waited as Chris Quinn, Bill de Blasio, Bill Thompson, John Liu, and Tom Allon jumped in to answer questions, at a forum on housing co-sponsored by the Daily News and the Metro Industrial Areas Foundation. 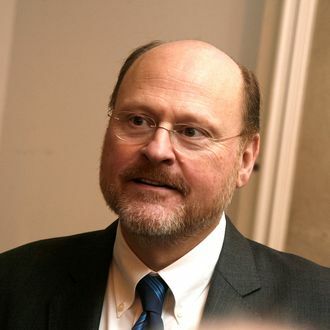 When Lhota did speak, he kept it short and low-key. He didn’t mention his blue-collar upbringing, or his years of government experience, or his years in business. When Lhota was thrown a hanging curveball of a question about what the city can do to help homeowners still reeling from Hurricane Sandy, he didn’t even cite his leadership of the MTA and how it got subways and buses back in service incredibly quickly after the storm. He didn’t shoot down the wildly expensive proposals the Democrats made. The things he did say — about the need to build more affordable housing and to manage NYCHA better — were fine. But he didn’t give anyone a reason to remember he was there, let alone vote for him. Everyone else did. Allon, who like Lhota is running in the Republican primary, got the biggest laugh of the night by equating NYCHA chairman John Rhea with Cathie Black. Thompson showed considerable spark, even daring to disagree with one questioner’s suggestion instead of simply pandering. Liu connected immediately by greeting the church-y audience with “Namaste!” and cited ways he’d used his powers as comptroller to encourage housing construction. Quinn was by turns folksy and authoritative — and she also conspicuously refrained from joining in the bashing of Mayor Bloomberg. “De-Bill-sio?” one man in the audience ventured afterward. “Bla-dasio?” asked a woman. They mangled the pronunciation. But both were clear on who’d made the best impression.